There's a lot we still don't know about Rockman Online, but developer NeoWiz are hoping to alleviate some of the mystery with your help. NeoWiz are presenting fans the opportunity to ask any questions they might have about Rockman Online. From gameplay specifics to the identities of bosses, there's really no shortage of questions you could ask. Since most of you probably don't speak a lick of Korean, a liaison has offered to translate and forward your questions directly to NeoWiz. Simply drop your questions in the comments below, and my pal Amunshen will send 'em off. We're anticipating quite a few questions, therefore I can only pick so many to be translated into Korean. Hey, be thankful: at least you're not being asked to dust off those English to Korean dictionaries! I'll be accepting questions from now until November 3rd; a good three weeks from today. The faster we get them in, the better. Have at it! Thanks for the tip, Amunshen! Why exactly were you picked to make Rockman Online, And how well do you think it'll be? So far, it looks great. Keep up the good work. * Why was it decided to make everyone clones (even the Navigators, apparently), and why do the trailers give no indication of this (that I'm aware of)? Will the originals show up at any point? 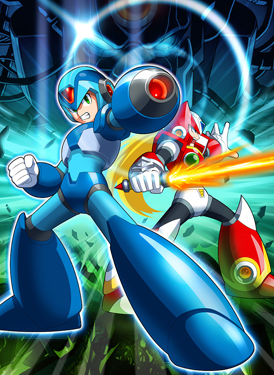 * Will this game take place in the same continuity as the MMX games, or will it be its own continuity (like Ruby-Spears Megaman, Ariga's mangas, and every other third-party Megaman production)? Will the game support gamepad play? The animated trailer showed Iris and Alia working together. Iris is long dead, so how's that going to work out? Will all of the characters shown in the two trailers be in the game itself? Playable or otherwise? Well I think I can answer that question about why they picked to make it... Because, a plan maker in Neowiz has submitted his plan to Make Rockman Online. I have known him who has been loyal fan of Megaman Series for several years since my elementary school age, and he has managed a large Megaman Fan site called "RockmanDashMania.com" from his High school years, which is unfortunately closed now. But according what he said in the conversation which he had with me last summer, as soon as he submitted plan and started on the Rockman Online, he got seriously sick and had no choice but only to leave the company and go to his hometown in order to convalesce...I hope him to be getting good now. Will they at least make it so you don't respawn immediately at the location where you die each time for at least the single player campaign? That kinda takes all the challenge out of the game. Will classic characters become playable? like megaman, protoman, bass and roll? Why did you choose PC as the platform? In b4 hundreds of "will the game come out in North America?" @ Tom: Because shes a clone too. they ALL are. Alia and Signas included. Will they be actively blocking North American access to servers? Will the network check file sizes and such to prevent fan translations? Any chance the company themselves will add an English option? If Free, could a third party put up additional servers? PS: I don't care if this never comes to North America. All I care is if it's in English and I can play it. @Tom "The animated trailer showed Iris and Alia working together. Iris is long dead, so how's that going to work out?" I think it will end in a beautiful reploid romance that would make George Takei cry. 1. Will you give access to the Philippines? 2. Will you provide a storyline? 3. Will you make an animated series (anime preferrably) based on the animation and designs of your trailers? There will be a single player mode?? *Will There Be Job Change Classes ? "3. Will you make an animated series (anime preferrably) based on the animation and designs of your trailers?" Will a software development company produce an animated series? That would be one talented Dev Team. Will Burn Dinorex (Mattrex) be in the game ? And Spike Rosered (Axle the Red) ? Is there some chance of Dynamo appear as an NPC on the Game ? And Iris ? "3. Will you license an anime based on your trailers, not you, seeing as you're a game developer company, but an animation studio?" And I admit, that may read a little weird, but just get what I mean ok? What would it take for this game to reach stateside? Will characters like the original Mega Man, Proto Man, Roll, Bass, etc. be available for creation, or is it only X, Zero, and Duo? How are characters from the Classic and X series together? If they're not really the actual characters themselves, and copies or Next Generation Reploids, why have the classic characters, who are out-of-date by technology's standards at that point in time? Also, where does this fit in the timeline? And finally, the question that's on everyone's mind, will this ever come to North America? Are the characters from the Classic series their own selves or are they too copies? If not copies, how are they getting into the future? And will future characters travel to the past as well? Can you tell us anything about the mysterious shadowy figure near the end of the first trailer? Will it be possible to change characters between stages? Or do you have to pick one when signing up and stick to it? Will the game eventually involve the events of the Cyber Elves War mentioned in Megaman Zero? Will the game have characters from the EXE and Star Force series? Thanks for doing all this, Amunshen. I'd like to know if the Mavericks Grizzly Slash(Crescent Grizzly) and The Silver(Spiral Pegacion) will make their presence in the game. Do you intend to put another Saga than Classic and X? Will there be an Axl Type character? People around the world want play this future game with this will make a global server? How is Megaman/Rock around? He got captured and reprogrammed by Wily 37 years after the Classic Series! 1) What system is this on? 2) Will there be other series represented besides Classic And X, like Zero or Legends? Is there any concern that Capcom will have Rockman Online canceled, as they did with Megaman Universe and Mega Man Legends 3? 1) I don't think we have a release date for this game yet, right? What is the currently projected release timeframe? 2) The trailers were amazing, but any indication why classic characters feature so heavily, when the playable characters are mostly from the X series? 3) Could you elaborate on the design and development priorities at the moment? Is it a priority to have a large number of playable character types? 3) How are you determining which characters are made playable in the game? Are you limited to only using characters from the Classic and X series as playable, or can we hope for Legends, Battle Network or Starforce characters also? Can we expect original characters of NeoWiz's own design? Or a design-your-own-character type option for players? 4) I understand discussion is already underway regarding a Japanese version. Any indication regarding the -certainty- of that release? -BTW, a Japan release would be much easier for us to get into than Korean, so if we don't get a US/global version, we should all be hoping for at least a Japan release. Thanks alot to Protodude and Amunshen. I definitely remain very interested in this game. Forte/Bass seems to be a very important character from the big topic you made of him. What is his purpose? Will be a playable candidate for the series? Will it release outside of Korea? When is it expected to be released? If out of Korea, when for those places as well? What are the expected System Requirements? Can it please be released in the North Americas? How's the grouping/partying feature, if any? Are there going to be dungeons/raids? Is it going to be quest-based leveling (Like WoW), or combat-based (Like FFXI)? How many characters can we have? Are you guys excited to be working on this? Do you guys think you'll play it after it's launched? Are there going to be Achievements? Is there going to be PvP? Are there going to be Guilds/Clans/Corps/etc.? If there are, will the be account-linked (Like Guild Wars), character-linked (Like WoW), or can you have multiple at once (Like FFXI)? Where are all the places it's currently planned to be released? Will it be a disc-installation, or internet-download? If so, will there only be passive 'pets' solely for decoration, or will there be 'pets' that can fight with you? Will there be an alternative mode for transport such as mounts, jetpacks, or vehicles? Will there be a friend/block function? Are there going to be choosable factions? Was Mega Man Online conceived as a potential bridge between the Classic Mega Man and Mega Man X series? It certainly seemed that way from the trailer. Will there be further appearances from such classic characters as Dr. Cossack? Rush? Beat? Tango? We can play with the classic rockman? or other classic series? so far like what I saw but I hope to play with the classic rockman. Will Rockman Online be a free-to-play game or a subscription game or a pay once game or will it be something else? Are you going to release this game worldwide? or on home console at least? Worldwide fans are excited and hoping for this game to come out in their country, no matter the console / platform to play it. I beg of you, PLEASE give it a North American release. Do you guys intend to make more characters playable? Are you gonna dump the project just like Legends 3? Any chance of us seeing Aile from ZX series ZXA Aile preferably. Playable would be nice. Vile/Vava would be good to see as well. I was hoping the bosses would get more attacks in the final version or perhaps more attacks depending on level/difficulty. Would that happen to be the case? Rockman Online is only for the heroes of classic and X, not ZX anyways. It can be too much complicate for the storyline. That might be true but if so then it doesn't apply to bosses or enemies. The first boss of Zero 2 is in one of the trailers. From early previews it looks like dashing is a skill/ability. Does this mean that you can't do it whenever you please? For instance, in the old snes X titles you could dash at the tap of a button and jump quickly after to gain extra distance. Basically, I'd like to know if the controls will be faithful to the original games? Its not the first boss of Zero 2, it's the first boss of mmx2.......who is remixed in mmz2, maybe. 1. When does this game take place? The game must be after Command Mission given the references in the game, but seems to be before all the stuff that leads into Zero and ZX. 2. Are the Robots from the past merely DNA Copies or are some of them actually from the 20XX period? Will the game explain how this is and what happens in the years between 20XX and 21XX? 3. Will the presumed presence of Light and Wily be explained somehow? Are they seen in flashbacks or are they somehow present in the future? 4. Is there hope of an International release, or at the least, of us getting the files for the game to do a private server?